Radiation is a form of energy that travels from a source as waves or as a stream of particles. Based on the energy of the incident photons, they are broadly classified into ionizing and nonionizing radiation. The ionizing radiation is being extensively used in industries and medicine for various applications. While exploiting the potential of the technology toward the betterment of human health, it also contributes dose to the background radiation. The scientific community is constantly updating and analyzing the knowledge about the sources and effects of radiation exposures. The amount of doses received by patients and its induced biological effects is an emerging area, as publications have reported an increased risk of developing cancer after X-radiation-based imaging. 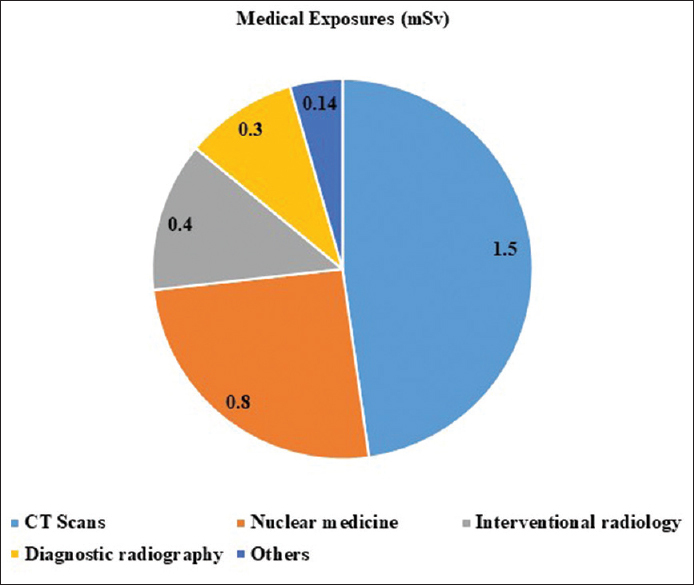 In this review, we attempted to summarize the radiation sources and the radiation doses received by the patients during various radiology imaging procedures from published literatures and then to add our laboratory data. All living organisms including human beings are evolved and existed in the environment which is being exposed to natural background radiation. Of the average background radiation exposure to human, 86% is from natural sources while 14% is from manmade artificial sources. In the recent past, it has been reported that humans have been exposed to higher proportion of artificial sources of radiation, and it was attributed due to an increased utilization of radiation-based imaging for diagnosis and treatment of various health alignments. The main sources of natural background radiation are cosmic radiation, terrestrial radiation and inhalation, and ingestion of naturally occurring radionuclides. A continuous stream of cosmic radiation to the earth comes from sun and stars. The amount of cosmic radiation received is based on different atmospheric conditions, differences in the altitudes, and on the earth's magnetic field. For instance, in northern Iran, due to the geological characteristics, the radiation dose reaches 260 mSv annually. The second main source is terrestrial radiation which is from the earth and radioisotopes of radium, uranium, and thorium that are present naturally in soil and rock. This is naturally high in some parts of the world. Within India, in coastal regions of Kerala, the annual effective dose is 12.5 mSv. Majority of the dose received from natural background is from radon which is present in the air. In addition to these, water and all organic matter (plants and animals) contain radioactive carbon and potassium with few traces of uranium and thorium. In total, the average effective dose is approximately 2.4 mSv annually (worldwide) from the natural background radiation. The radiation and its uses have been increased enormously over the past few decades for various purposes as follows: from military to medical applications (cancer radiation therapy and X-ray-based imaging for diagnosis intervention radiology imaging procedures) and from electricity production to domestic applications (smoke detectors). The quantum and type of human exposure to manmade radiation sources differ for population: (i) members of the public and (ii) occupationally workers. The general members of the public are being exposed to various sources of radiation from medical and consumer products. Radiotherapy, nuclear medicine examinations (Iodine-131 and Caesium-137), X-rays, and computed tomography (CT) scans are the main medical sources of radiation. Few consumer products such as security systems using X-rays, combustible fuels and gases, building construction materials, smoke detectors, lantern mantles, and tobacco also add up to the manmade sources. Individuals who work in various departments such as radiology, nuclear medicine, radiation oncology, and nuclear power plants get exposed to radiation. These and many other artificial sources of radiation add to the effective radiation dose for both individuals and the global population. The use of ionizing radiation such as X-rays plays an important role in the field of medicine. While adopting the radiation based technology to improve the betterment of human life, they also contribute to the background radiation, which indirectly increases radiation exposure to humans. The medical uses of radiation are based on the “risk” versus “benefit” ratio. Nevertheless, the uses of radiation are not devoid of criticism due to the emerging literature resources on the effects of radiation exposure. Most of the medical radiation exposures come from the use of standard X-ray and CT scan technology to diagnose and treat various diseases. It is reported that CT examinations contribute 1.5 mSv, followed by nuclear medicine and interventional radiology contributing 0.8 mSv and 0.4 mSv, respectively [Figure 1]. Based on 2008 UNSCEAR report, annually around 3.6 billion medical radiation procedures were performed with at most 50% increase, with previous survey which was 2.6 billion procedures (1991–1996). Significant raise of radiation based applications in medicine indirectly contributes to increased level of public exposure from manmade sources for general public as well as occupational health workers. The main four categories of medical practices which require radiation are radiation therapy, nuclear medicine, diagnostic radiology, and image-guided interventional procedures. Radiation therapy, on the other hand, uses radiation not only to treat diseases like cancer but also to treat some benign tumors. During 1997–2007, about 5.1 million patients were treated annually with radiotherapy, which is higher than the previous survey (4.3 million) in 1998. About 4.7 million and 0.4 million were treated by teletherapy and brachytherapy, respectively. Thus, about 25% of the populations living in industrialized and developed countries receive 70% of the radiotherapy treatment worldwide. The other branch of radiology involving medical imaging with radioactive isotopes is nuclear medicine. They are non-invasive and are widely used to treat various diseases. Procedures such as positron emission tomography and I-131 radiotherapy use small amounts of radioactive materials called radiotracers, which are injected into the bloodstream. The radiation dose depends on the weight and body part of the patient to be imaged. During these examinations, a low whole-body radiation exposure is maintained by the nature of radiopharmaceuticals which is targeted to the organ of interest alone. The major contribution to medical exposure comes from diagnostic radiology using the X-rays; these include plain radiographs, mammography, images obtained using fluoroscopy (enema or barium), and computerized reconstruction technology such as CT. In addition to these diagnostic imaging, interventional or non-invasive procedures which are done using a catheter to obtain images are also carried out in hospitals. It has been reported that annual per caput dose rose from 0.35 mSv to 0.62 mSv by the worldwide usage of radiation diagnostic medical examinations, thus making it as a prime source of radiation exposure [Table 1]. 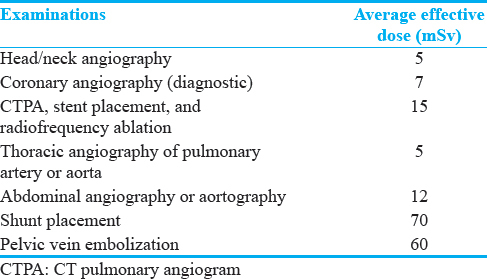 Among the various diagnostic examinations (chest radiography, abdomen X-ray, and mammography), CT scan and angiography are high (7.4 mSv and 9.3 mSv, respectively) in the average effective dose delivering per examination [Table 2]. 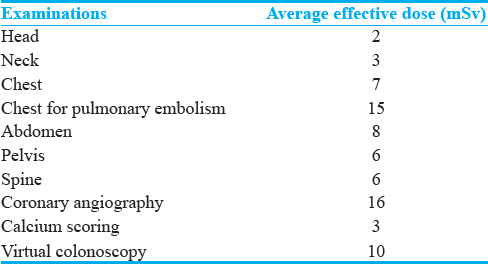 As reported in UNSCEAR, the mean effective doses for various interventional and CT examinations were comparatively higher than that of other radiological procedures [Figure 2] and [Figure 3]. Thus, the total collective radiation dose from medical sources to the global population was approximately 4,000,000 mSv, making it to 73% of the total radiation dose in health care Level I countries. The average effective doses vary by over 0.01–10 mSv in the standard radiographic examinations. On the other hand, a very narrow range is observed in CT examinations, but their effective doses are high (~2 mSv to 20 mSv). According to the biological effects of ionizing radiation VII, the risk of cancer was documented in patients who received a considerable amount of radiation dose during various CT examinations. For example, high risk of cancer was identified in individuals who survived the Hiroshima and Nagasaki atomic bombs. They were exposed to radiation during the attacks. A single-CT examination can deliver a similar amount of dose (equivalent to that 10–100 mSv received by the survivors of the Hiroshima and Nagasaki atomic bomb) and sometimes patients may have to undergo multiple CT scans in their lifetime period. This may result in developing stochastic effects (cancer) as there is an increase in large number of patients exposed to high doses of radiation from CT examinations. In the case of interventional procedures, the average effective dose ranges from 5 to 70 mSv. A coronary angiography delivers a significant amount of radiation to the patient which is equal to 300 chest X-rays, while coronary stent sums up to 1000 chest X-rays and radiofrequency ablation up to 1500 chest X-rays. In some cases, the skin dose may rise up to 2 Gy, above which the deterministic effects such as skin burns and erythema are observed. The occurrence of deterministic and stochastic effects has been an area of serious concern in interventional procedures. 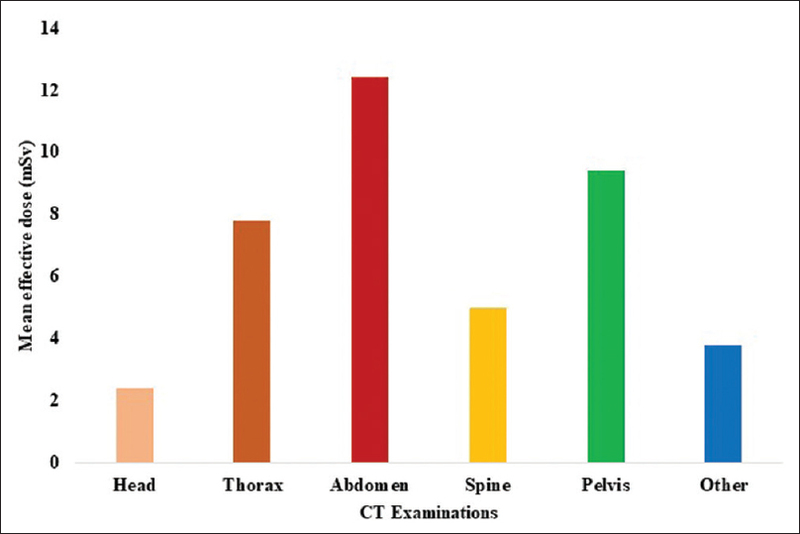 Being the major contributors of medical exposures, the average effective doses for various CT and interventional examinations are given in [Table 3] and [Table 4]. There are high concerns about the health of the population due to overgrowing usage of medical imaging procedures which have led many researchers to focus on the biological effects and the lifetime risk attributed to these radiation medical exposures. As an attempt, we recorded the entrance surface dose (ESD) during diagnostic examinations such as CT and neurointerventional procedures. Since its inception from 1970s, the use of CT has been increased rapidly. It has transformed the field of imaging in medicine by yielding three-dimensional views of organs and regions of interest. The purpose of imaging is diagnosis and screening in symptomatic patient and asymptomatic patients. These medical procedures have provided huge benefits to the patients, but they also deliver high doses of ionizing radiation. Despite the IAEA reports, the summarized range of doses received by patients during these imaging procedures differs widely. This depends on number of factors such as the tube current and scanning time in milliamp seconds (mAs), patient's body mass and size, the axial scan range, the scan pitch, the tube voltage (kVp), and the distinct design of the scanner used., However, limited data are available on the amount of dose being received in various CT examinations when applied in practice in the Indian scenario. In our pilot study, we have measured the ESD in patients (n = 27) who underwent CT examinations. These values were compared with dose-length product values. 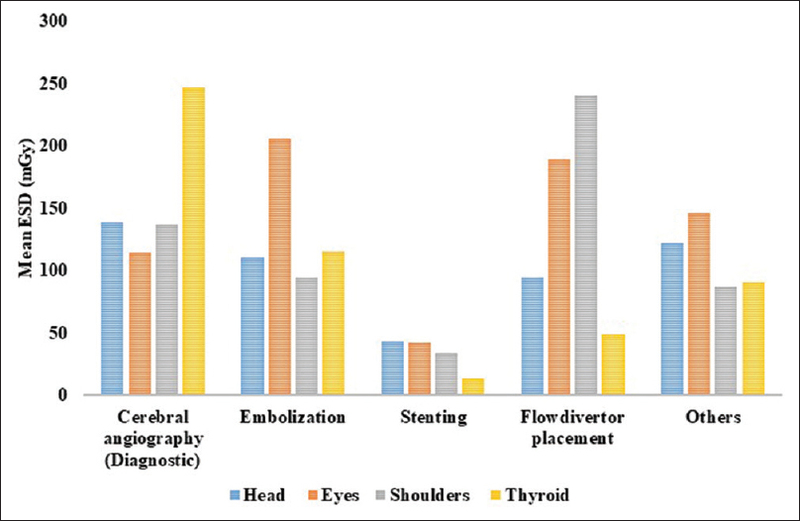 The overall measured mean ESD ranged from 1.92 to 518.12 mGy for the eye, 0.84 to 210.92 mGy for the head, and 0.70 to 265.99 mGy for thyroid [Table 5]. 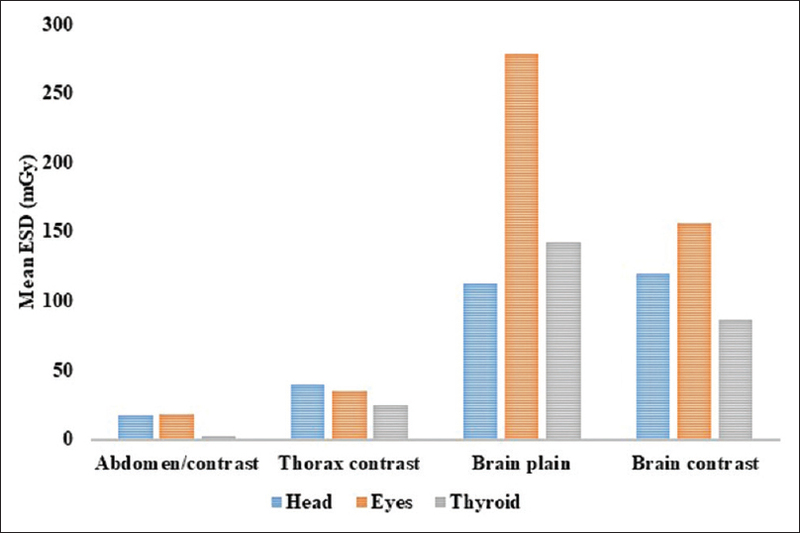 The ESD was high in the head, eyes, and thyroid for plain brain CT examination and low for abdomen contrast examination [Figure 4]. However, the dose reported by Mettler et al. indicated lower doses to these organs. This can possibly be due to the differences in the doses and machine parameters employed for imaging. Based on recent epidemiological studies, cumulative doses of about 50–60 mGy tripled the risk of developing leukemia and brain tumors in children who underwent CT examinations. It is a specialized branch which studies about the vasculature and potential pathologies of the brain. It uses transfemoral artery technique by means of catheterization. The neurointerventional radiological procedures are mainly categorized as a diagnostic procedure, where the main objective is to identify the neurological problem, whereas another increasing proportion is grouped as therapeutic procedure, which is undertaken to treat a neurological condition. Procedures such as coiling, stenting, flow diverter placement, and embolization come under the category of therapeutic procedures. To visualize and evaluate the vascular pathological conditions, these procedures require good images with high quality. Thus, longer fluoroscopic times with significant number of angiographic images indirectly contribute to more dose. As the fluoroscopic time with X-rays exposure is high in these procedures, it results in cumulative patient dose which is high. These interventional procedures are often complicated. It requires more fluoroscopy time and repeated angiographic images for controlling the catheter position, and this, in turn, delivers a significant dose to both operator and the patient. Like CT examinations, doses received by the patient and operators during these procedures have been documented., For interventional procedures, it is difficult to provide a generalized data because of the wide variety of fluoroscopy procedures. The dose range may vary extraordinarily different even with the same procedure performed in the same medical center. This variation is mainly due to the patient's body habitus and the complexity of the procedures. We have measured the ESD to the patients during various neurointerventional radiology procedures. The overall measured mean ESD (n = 51) using thermoluminescence dosimeter, ranged from 4.91 to 273.01 mGy for head, 12.47 to 777.31 mGy for eyes, 0.99 to 433.34 mGy for shoulders, and 4.70 to 242.50 mGy for thyroid [Table 6]. Among the various neurointerventional procedures, the flow diverter placement delivered considerably higher dose while stenting delivered the least [Figure 5]. These results are comparable with our previous study, but it is less for diagnostic (140–1130 mGy) and therapeutic procedures (400–1500 mGy) reported by others. The global uses of medical radiation procedures and the estimates solely depend on national surveys and extrapolation methods. The methodology followed by UNSCEAR for global estimations depends on the development of health care in each country. Currently, there are more data available from well-developed countries than from underdeveloped countries. Thus, studying about the radiation exposures from medical examinations and practices in each population is more important. Although medical uses of ionizing radiation have improved the human health in various aspects, we cannot deny the fact that they symbolize the major manmade sources of radiation to the human population worldwide. Based on the results we obtained, it is clear that these medical radiation exposures do deliver a considerable amount of radiation dose to the patients during various examinations. Thus, these procedures should be carried out with minimal radiation exposure without compromising the imaging modality. This study was financially supported by DST INSPIRE Fellowship 2016 (IF160643). Shahbazi-Gahrouei D, Gholami M, Setayandeh S. A review on natural background radiation. Adv Biomed Res 2013;2:65. Annex C. Exposures to the public from man-made sources of radiation. Sources and Effects of Ionizing Radiation: Sources. Vol. 1. United Nations Scientific Committee on the Effects of Atomic Radiation (UNSCEAR): New York. United Nations Publications; 2000. p. 157. Ngachin M, Garavaglia M, Giovani C, Kwato Njock MG, Nourreddine A. Radioactivity level and soil radon measurement of a volcanic area in cameroon. J Environ Radioact 2008;99:1056-60. Schauer DA, Linton OW. NCRP report no. 160, ionizing radiation exposure of the population of the United States, medical exposure – Are we doing less with more, and is there a role for health physicists? Health Phys 2009;97:1-5. Mettler FA Jr., Bhargavan M, Faulkner K, Gilley DB, Gray JE, Ibbott GS, et al. Radiologic and nuclear medicine studies in the United States and worldwide: Frequency, radiation dose, and comparison with other radiation sources–1950-2007. Radiology 2009;253:520-31. Balter S, Schueler BA, Miller DL, Cole PE, Lu HT, Berenstein A, et al. Radiation doses in interventional radiology procedures: The RAD-IR study. Part III: Dosimetric performance of the interventional fluoroscopy units. J Vasc Interv Radiol 2004;15:919-26. Malone J, Holmberg O, Simeonov G, editors. Justification of Medical Exposure in Diagnostic Imaging. Proceedings of an International Workshop on Justification of Medical Exposure in Diagnostic Imaging Organized by the International Atomic Energy Agency in Cooperation with the European Commission and held in Brussels; 2009. World Health Organization. Radiation Protection in Medicine: Setting the Scene for the Next Decade. Proceedings of an International Conference; 2015. Kanagaraj K, Abdul Syed Basheerudeen S, Tamizh Selvan G, Jose MT, Ozhimuthu A, Panneer Selvam S, et al. Assessment of dose and DNA damages in individuals exposed to low dose and low dose rate ionizing radiations during computed tomography imaging. Mutat Res Genet Toxicol Environ Mutagen 2015;789-790:1-6. Berrington de Gonzalez A, Salotti JA, McHugh K, Little MP, Harbron RW, Lee C, et al. Relationship between paediatric CT scans and subsequent risk of leukaemia and brain tumours: Assessment of the impact of underlying conditions. Br J Cancer 2016;114:388-94. Bedetti G, Botto N, Andreassi MG, Traino C, Vano E, Picano E, et al. Cumulative patient effective dose in cardiology. Br J Radiol 2008;81:699-705. Miller DL, Balter S, Cole PE, Lu HT, Schueler BA, Geisinger M, et al. Radiation doses in interventional radiology procedures: The RAD-IR study: Part I: Overall measures of dose. J Vasc Interv Radiol 2003;14:711-27. Barrera-Rico M, López-Rendón X, Vega-Montesino S, Gamboa-deBuen I. 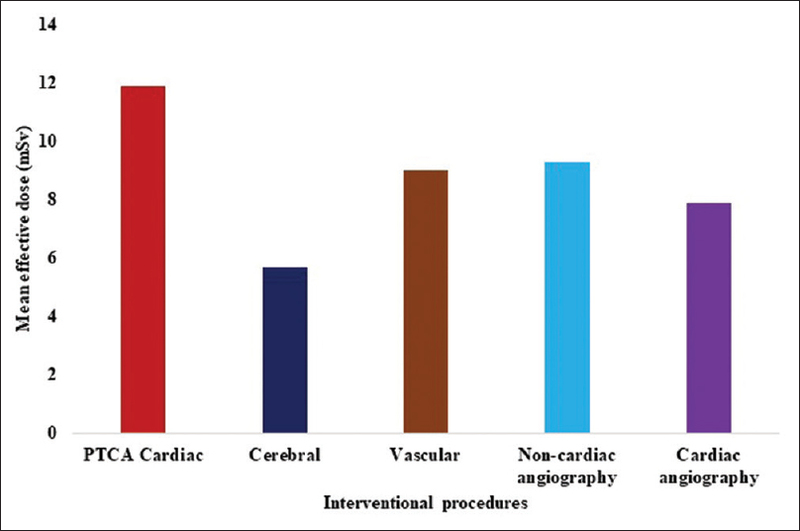 Entrance surface dose in cerebral interventional radiology procedures. Radiat Meas 2014;71:342-8.